St. Francis mourns the passing and celebrates the life of our beloved Capuchin Franciscan Friar Fr. Flavian Welstead. Fr. Flavian Welstead was born to John and Eileen Welstead in Douglas, Cork, Ireland on September 24, 1939. At his baptism he was given the name Patrick Finbar. He was received as a Capuchin Franciscan on October 3, 1959 in Rochestown, County Cork, where he took Flavian as his religious name. A year later on October 4th he made his first profession. He studied philosophy at St. Bonaventure's and took his theology courses at Ard Mhuire Friary. On May 21, 1967 he was ordained at the friary chapel there. After Ordination, Flavian was assigned to the Irish Capuchin Mission in Zambia, Africa for the next four years. He served at several mission stations in this short period of time; Sioma, then Manganga and St. Theresa's Cathedral at Livingstone. In 1973 he was assigned to serve in the Vice-Province on the West Coast of America. He served in Hermiston, OR for one year and then was assigned to St. Francis High School in La Canada, CA, as a teacher, for one year. He would return to the high school again in the 80's and 90's as a teacher and Director of Development. Also in this time span he served for three years at St. Joseph Parish in Roseburg, OR and at St. Francis Parish in Bend, Or. He also served as an associate pastor for the first time at Our Lady of the Angels Parish in Burlingame, CA from 1986 to 1989. Flavian was very outgoing. He easily made friends and was able to gather a strong support team for whatever task he was about, whether it be youth ministry, spiritual retreat programs or development fund raising. Flavian was very hospitable to all and he loved the people he served. In his younger days he played soccer and golf and was also a bit of a prankster loving a good laugh. Above all, Flavian loved ministering the sacraments and being with the people he loved in their time of need. From 1991 to 2000 he was at our provincial friary of St. Francis in Burlingame, CA where he served as the Development Director for the Province of Our Lady of the Angels. After a mini-sabbatical in the last half of the year 2002, he returned to Burlingame as the associate pastor of Our Lady of Angels Parish where he remained until His Lord and Master called him home December 4, 2017 at Peninsula Hospital in Burlingame, CA. He is survived by two sisters Jane O’Brien and Marie Furlong. He has two deceased brothers Noel Welstead and Donal Welstead. Vigil on Monday December 11 at 7pm and Funeral Mass on Tuesday December 12 at 10am at Our Lady of Angels Church, Burlingame, CA. Mass of Christian Burial at Old Mission Santa Ines, Solvang, CA at 10am on Wednesday December 13. Following the Mass will be the burial at San Lorenzo Friary, Santa Ynez, CA. Reception will follow at Old Mission Santa Ines parish hall in Solvang, CA. In lieu of flowers please consider making a donation in memory of Fr. 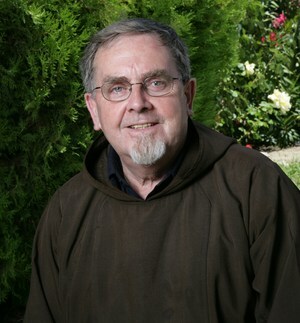 Flavian Welstead to the Capuchin Franciscan Order, 1345 Cortez Ave., Burlingame, CA 94010.